If you have scheduled a procedure to repair a torn ACL, you’re probably wondering, “How long will I be out of my normal routine?” While this is an important question, there is much more to ACL surgery recovery than just getting back on your feet. Even after you’re able to walk without crutches or other assistive devices, your body is still healing, and the recovery process continues. It’s a good idea to understand the recovery timeline and know what you can do to keep the healing process on track. Your doctor can provide specific recommendations based on your unique situation, but in general, the following timeline and rehabilitation tips may help you recover as quickly and safely as possible from ACL surgery. This is a critical time during the recovery process because it is when your body is most vulnerable. Surgery is a traumatic experience for your muscles, ligaments, and other tissues, which is why the body responds with inflammation. During the period immediately after surgery, you may experience pain, swelling, andthe buildup of excess fluid around the knee joint. The rehabilitation process starts right after the surgery, and you may be given exercises that must be performed daily to support your recovery. During this time, you will not be able to bear weight on the affected leg, so plan on using crutches and limiting your mobility. You may begin to be able to bear weight on both legs during this time, but activity may still be limited as your tissues are actively healing. Depending on the type of car you drive and which leg is injured, you might also be able to resume driving during this time. Your physical therapist will focus on helping you regain full range of motion. Because your knee is still vulnerable at this stage, you may have to wear a protective brace to protect it from unnecessary stresses. As the healing process progresses and your knee continues to grow stronger, you may be allowed to do more low-impact activities such as cycling, swimming, and rowing. By the end of this period, you may resume light jogging if your physical therapist thinks you are ready. During this time, you continue sport specific training towards a safe return to athletic activity. Your physical therapist will continue to recommend strengthening exercises to support the connective tissues in the knee joint. He or she might also show you ongoing exercises that may help protect the ACL and help prevent future injury. 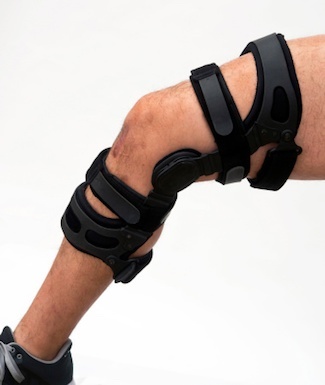 A knee brace may be recommended during this period, even for low-impact activities. After six months, assuming your damaged tissues have fully healed, you can return to athletic activity. Some doctors recommend the use of a supportive brace for one to two years after ACL surgery. Being proactive in your recovery can result in healing as quickly as possible, less pain, and a quicker return to your previous activity level. It can be tempting, especially for athletes, to push your body to the limit when doing physical therapy. Although it is important to perform the recommended strengthening and stretching exercises, doing too much too soon can actually slow down the recovery process. Follow your physical therapist’s recommendations about which exercises are appropriate and how much you can do. If you think you can do more, check with your physical therapist before attempting to go further. Pain and swelling are at their peak in the first week after ACL surgery. It is especially important to apply cold therapy during this period to help reduce swelling and control pain naturally. Adding active compression with a cold therapy device may further reduce swelling by helping your body pump away excess fluid and enabling the cold to penetrate deeper for a longer-lasting therapeutic effect. Continuing to use cold therapy throughout the duration of your recovery may help promote healing and control any pain and swelling you might experience after physical therapy sessions. So how long will you be on crutches after surgery? It depends on a number of factors, but if you are proactive about accelerating the healing process, you may be off of crutches as soon as two weeks after surgery. If you are about to have ACL surgery, ask your doctor about using Game Ready during recovery. The combination of therapeutic cold and active compression is proven to be more effective than ice alone. The recovery process is also more comfortable, with natural pain relief and less swelling around the knee joint. Contact us today to learn more, or find a provider near you.